Wireless Equipment from Juice will need a license where multiple devices are used. These are available from JFMG or Juice can book on your behalf for a fee. However for up to four frequencies (six with some devices). So long as you agree to accept interference where it happens and not to create interference for others see paragraph below. The de-regulated licence-free spectrum 863-865MHz remains untouched by DSO (Digital Switch over) If you are currently operating in this area of spectrum, you are free to carry on using it now and beyond the 2012 DSO. This means that for School Events, fetes you can use a wireless system so long as it remains tuned as set by Juice. If you want more information on this or want to know what frequencies to use in channel 70 go to our information page and click on wireless. Event Communication Systems from Juice Sound & Light include Walkie Talkies and all the accessories. We have Hytera TC700 units flightcased in sets of eight with case mounted charging pods. At Juice Sound & Light we stock UHF Handheld's with dynamic and condenser capsules and Beltpacks with headsets and lavaliere microphones from Broadcast quality to theatre stocking Shure, Sennheiser, Trantec and QTX enabling us to offer a system to s uit your event or show at a price to match your budget. 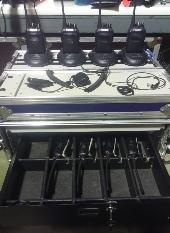 Of course they are available in pairs, threes fours or more with one or more charge pods as required along with fist mics, D shaped sets, ear tubes and correct licensing just request them for your next event with us.